She went deep into the racks of a Goodwill store in Los Angeles for a collection released Friday on Thrilling that will benefit employment programs for the disabled and disadvantaged run by the nonprofit’s Southern California operation. 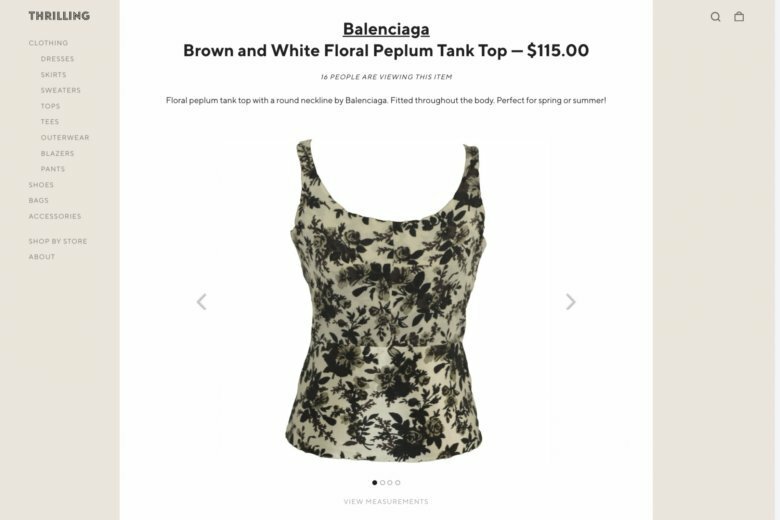 Among her favorite pieces in the collection is a Balenciaga tank top in a brown and white floral peplum design, priced at $115. The gems she unearthed in a Goodwill store in LA’s Los Feliz neighborhood include some oversize blazers from the 1980s and a pair of Chanel ankle-strap flats in black — selling for $199. While some of the collection’s pieces are priced in the low range, including a Tom & Jerry checkered bomber jacket for $30, others are going for up to $299 (a Prada oversized windbreaker in black). Looking for a Louise Vuitton key holder? There’s one in blue and white checks for $150. When Mandelkorn has the time, and she’s shopping for herself, she remains drawn to vintage and thrift. But she doesn’t have a magic formula for finding the really good stuff, which is plentiful in Los Angeles, where she lives. “I love to find pieces with real stories,” said the Boston native. It’s not so much about the labels for Mandelkorn. It’s about individual pieces that speak to her. That, she said, is a very personal thing. The collection was already selling out on it first day. Being thrift, once it’s gone, it’s gone, Mandelkorn noted.